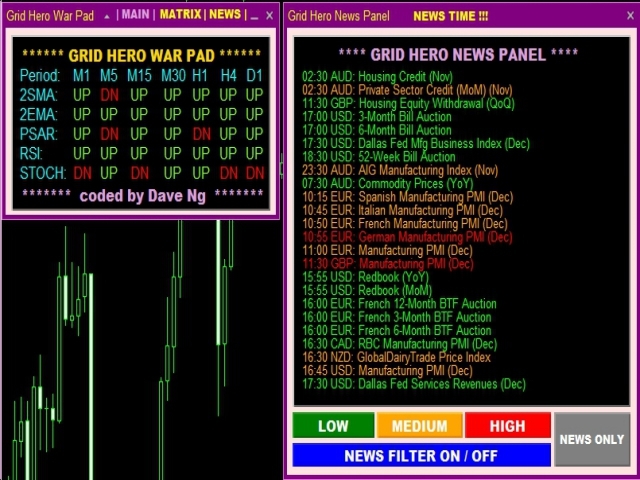 Grid Hero War Pad is a GRAPHICAL MANUAL TRADER version of the original Grid Hero EA, designed and created for ADVANCED TRADERS who are experienced in plotting their own market entries. 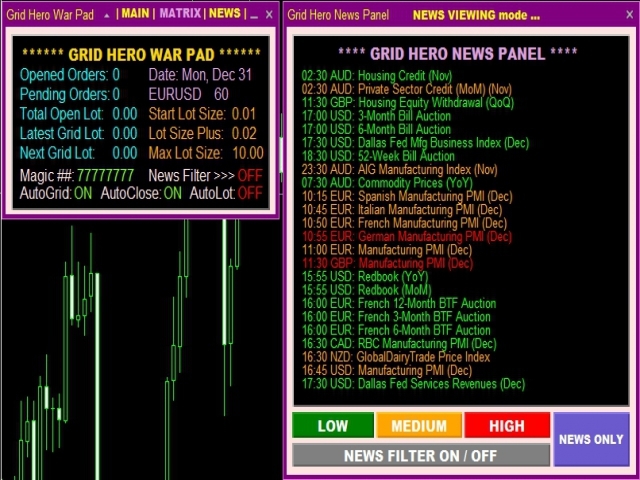 It is coded using ADVANCED GRAPHICAL INTERFACE programming, that combines the power of discretionary trading with Grid Hero algorithm in the form of a graphical console with button-click easy execution. 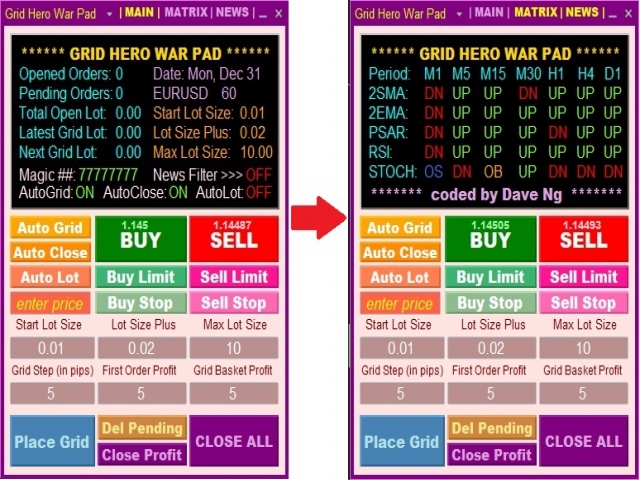 It allows you to execute trades manually using Market Orders and Pending Orders, and then automatically uses the original Grid Hero averaging algorithm to follow up with your manual entry according to your own rules and how you want it to. Basically you are in full control this time as it takes trading decisions from you as you decides when and where to enter the market, and it lets you set your own risk, make your own rules, and take your own exits. You call the shots, your game, your rules, your call. As such it is important to set the right expectation when using this product because ultimately the trading success from using this tool SOLELY DEPENDS ON YOU, your trading decisions and how you set up your entries & rules according to your own trading vision. This product is categorized as a manual trading tool under the UTILITY genre, hence it is NOT an Expert Advisor. This product rely on the user to make the first trade entry and DOES NOT automatically open first order entries for you. This product is meant to be used by advanced traders who are experienced in plotting their own market entries, or experienced in Grid trading. This product CANNOT BE BACK TESTED as it is considered a manual trading tool, not an expert advisor, hence it will NOT work in Strategy Tester. The trading success from using this product solely depends on you the user, as your own trading decisions are the key to your own trading results. 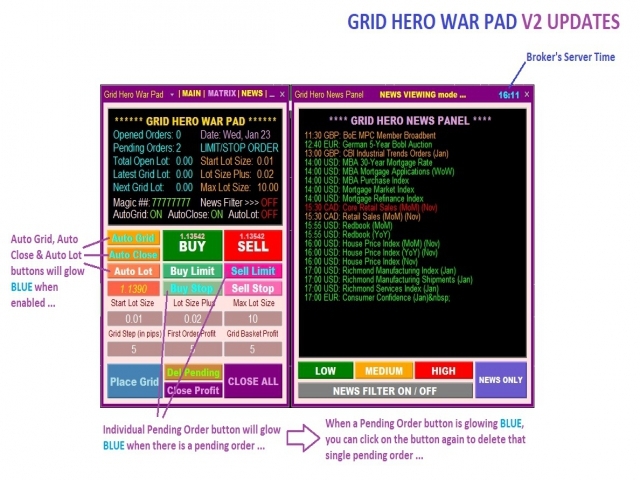 It is recommended to use the product SEPARATELY from the original Grid Hero EA, and not to intervene with the trades from the original Grid Hero EA. DO NOT buy this product if you intend to use it as a TRIGGER HAPPY tool in opening trades without any analysis or reasons, because this tool is NOT a holy grail. DO NOT buy this product if you are new to trading or you are an inexperienced trader who are inexperienced with market analysis or finding valid trade entries, or no experience in grid trading. 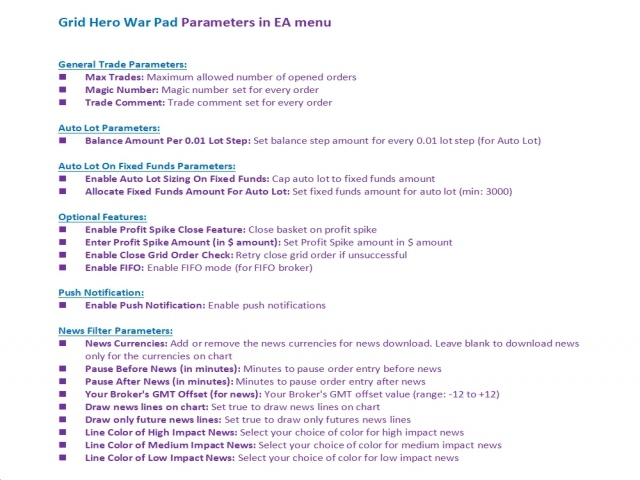 DO NOT buy this product if you are looking for a fully automated EA or system, because this product is a manual trading tool and it is NOT an Expert Advisor. 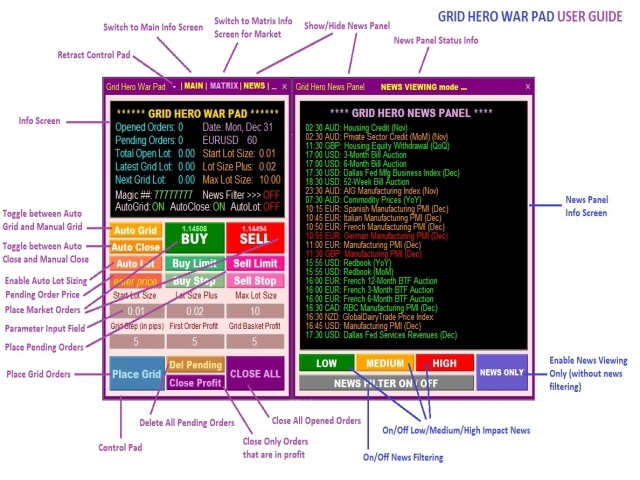 DO NOT buy this product if you are not comfortable with the nature of how Grid strategy works, because this product uses Grid style approach to follow up your manual entry. DO NOT buy this product if you are looking for a conventional strategy with positive risk reward ratio, SL or TP or Trailing Stop, because this product never uses any SL or TP or Trailing Stop. DO NOT buy this product if you are not comfortable with lot incremental approach or having multiple positions running at the same time, because this is how a Grid strategy works by nature. DO NOT buy this product if you are expecting the author to develop this into a conventional trading tool, or incorporate automated entries in future, because this will never happen. A piece of junk! 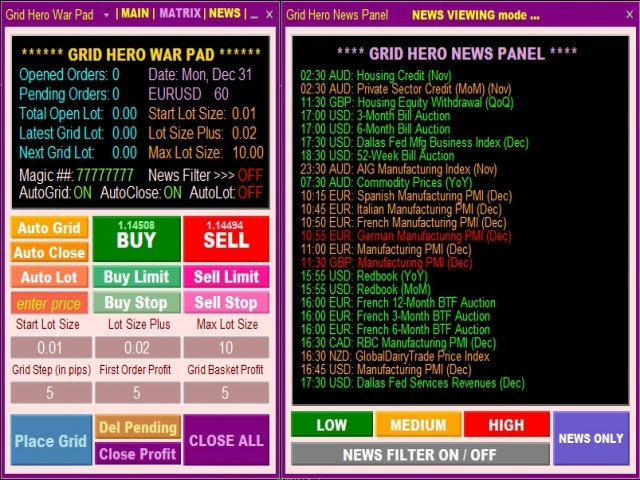 It's not worth the price, even the original grid hero did not survive more than 200 pips up/downtrend. The creator never listen to suggestions for improvement! You can judge that by reading the comments section! I wish I could get a refund! This is an excellent trading tool. I enjoy it a lot using it ! The response from the author is quick and very helpful. Thanks!! 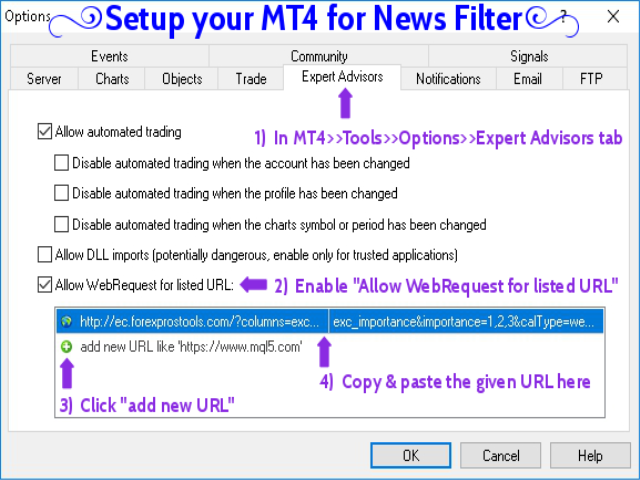 thanks for this excellent tool I was missing in my trading arsenal. If one carefully read your recommandations and does not expect a "holy grail" it is perfect. Although I am more than 30 years in the market and tried a lot I am 100% happy with this tool and your support. Honestly spoken, its a must for every serious trader ! The bugs with the display panel have not been fixed. This is more than an "esthetic" issue, this is a functional one. When MT4s restart (due to system failure, unplanned shutdowns, restarts, etc.) they need to pick up their open trades (based on their Magic number)...this is the problem. When GHWP restarts, the displays fail, and the EA works erratically. This was reported already back in February, and we still haven't heard if Dave is going to fix it. I am so surprised about this given Dave was so diligent and focused on Grid Hero when it came out and the year that followed...but I don't find his focus yet on this EA. It's a pity, this EA has a lot of potential. 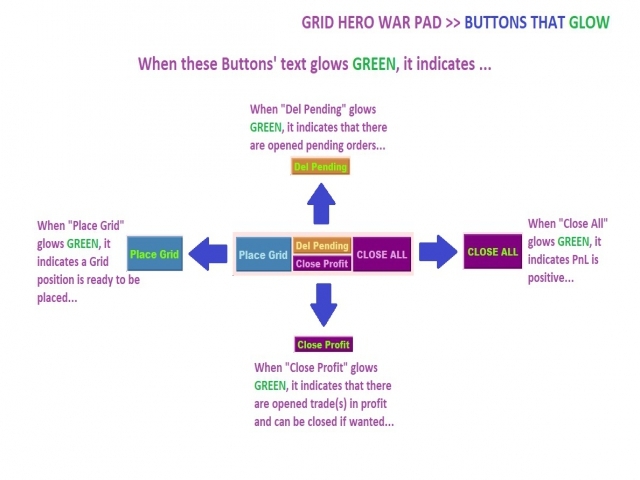 * In difference to Grid Hero, with this one you have NO IDEA when your grids are going to close! The "Pips needed to close grid" display is gone! If you use 1 grid, it's fine, but when using multiple instances all with different entry points, steps, lot sizing...it is a true NIGHTMARE! * You cannot modify the color schemes of the main interface (borders, background, font color, etc.). This is not a critical element, but when using multiple instances it gets very confusing, and....once again, for ~ 400 bucks I would have expected an interface that was a lot more customizable. 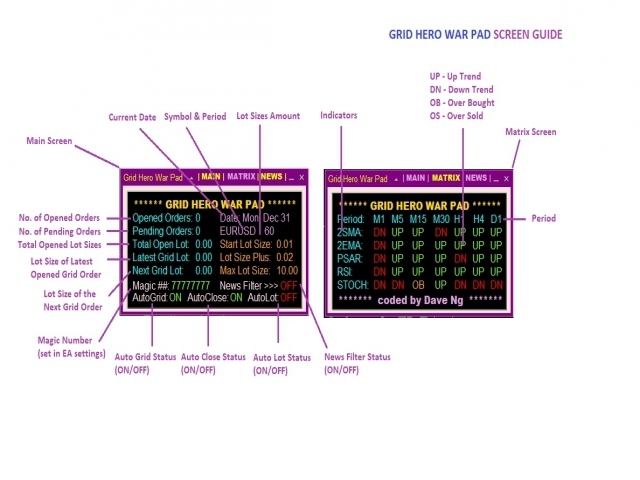 War Pad makes manual trading enjoyable again. You need to choose wise entry points, and start with a small initial lot (0.01) until you are consistently choosing great entries. Ironically though, it is when your entry is not perfect that you make more money as the basket lot size increases. A great tool, but make sure you are not trading against a very strong trend. Great author too, he rewrote the code to suit my 4K laptop display. A must buy for experienced traders. Its like trading with insurance. 5 Stars. If I could program, I would make a similar product!)) Everything I needed in my trading is collected in this tool! Thanks Dave!